These folding straight razors are high quality and affordable. The Red Deer logo is engraved on the blade. When you wake up at dawn and you're getting ready to go out on your mission, you can shave the old fashioned way, like your father used to...like a man. 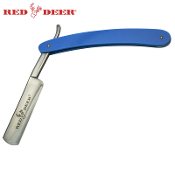 Red Deer Straight Razors are sharp to the touch and provide a safer alternative for your skin verses today's razors. This razor stretches 10" overall and features a surgical steel blade with a full 3" face. The abs handle makes it durable yet lightweight and easy to work with.